The Fall athletic season is wrapping up, and it has been a great season for the Navigators in all sports. Many of our athletes will be continuing on to post-season league championships and HHSAA State championship play! Here is a look back at the accomplishments of the IPA Navigators over the past three weeks. The Sporter Air Riflery team wrapped up their regular season on Saturday, October 8, with the Varsity Girls taking home a win against Pac-5 and another win the prior week against La Pietra. The Boys Varsity team was successful last week, with a big win against Punahou (1029 to 867). The JV Boys also beat Punahou, and took 2nd place in the ILH. The Girls JV had close matches, but came up short against La Pietra and Punahou. Mina Cintron (’20) and Aimi Imagawa (’20) shooting at the Punahou range. 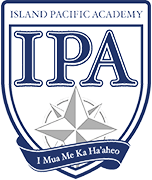 IPA Navigators competing at the Punahou range. ISLAND PACIFIC ACADEMY sent 13 shooters – more than half the team – to the ILH Individual Championships at Mid-Pacific on Saturday, October 15, where the Navigators took home six medals. Kyra Kobashigawa (’18) took home a Silver medal for prone position. JR Gillette (’17) took home a Bronze medal for prone and a Bronze medal for standing. Elise Pangelinan (’18) won the Bronze medal for standing. Marcos Lencinas (’20) took home a Bronze medal for prone, and Nalu Paz (’20) also brought home a Bronze medal for prone. 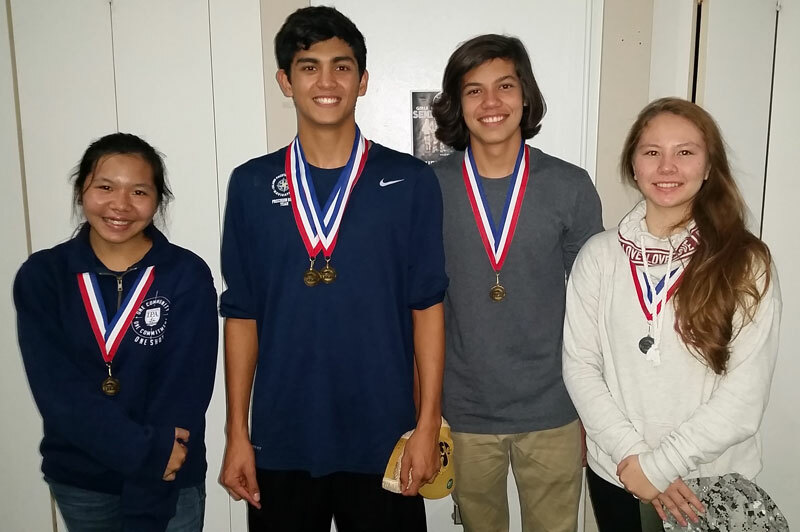 IPA shooters bring home the medals at the ILH Individual Championships on Saturday. Five shooters from the Varsity team have earned a berth at the HHSAA State Championships on October 25 – Jake Yeager (’17) and JR Gillette (’17), and Alyssa Okimoto (’18), Kyra Kobashigawa (’18), and Elise Pangelinan (’18). Jordan Carrancho (’18) will be a second alternate. Congratulations on a great season, and good luck at the championships! Way to go, Navigators! Navigator bowlers have put in a great effort this season, even though their win-loss record may not reflect it. Varsity bowler Brandi Chun (’18) has a great season going, and is holding her position in the ILH at 4th place. Brandi is headed for her third HHSAA State Tournament. Good luck, Brand! And congratulations to the whole team! ISLAND PACIFIC ACADEMY cross-country runners continue to put up good times at their meets. On Saturday, September 24 at CORP, Varsity runner Frank Condello (’18) ran the 5000 m in 18:37.90, and Intermediate Boys runner, Tayshaun Arce (’22), had the best time for IPA at 15:41.62 in the 2-mile race. Andie LeDoux (’21) ran a 14:30.05 in the Intermediate Girls 2-mile. In the meet at CORP on Saturday, October 1, IPA entered two Varsity, two JV, and 10 intermediate runners. And last Saturday, October 10, ISLAND PACIFIC ACADEMY fielded 13 runners at the Punahou Invitational. Breana Higa-Alexander (’21), Andie LeDoux (’21), and Madison Mizon (’22) after their race. (Photo courtesy of Andrew Mizon). Tayshaun Arce (’22) pushing hard in his race. (Photo courtesy of Andrew Mizon). Frank Condello (’18) is running strong in the 5000 m. (Photo courtesy of Andrew Mizon). On Friday, October 14, IPA fielded eight runners at the ‘Iolani Intermediate Invitational. The highlight of the day was Breana Higa-Alexander (’21) taking home a Bronze medal for finishing in 8th place! Breana Higa-Alexander (’21) (third from right) finished in 8th place to earn a Bronze medal. Varsity runner, Frank Condello (’18), is eyeing a berth at the HHSAA State Championship on the Big Island. Congratulations, Navigators Cross Country! The Varsity and Intermediate Pac-5 football teams have struggled this season, with recent losses to Punahou, Damien, and St. Francis. The Varsity match-up against Damien was a tight and exciting one, with the game running into TRIPLE overtime. Pac-5 came up short, 50-49. Pac-5 Varsity finished their season Thursday night. Pac-5 Intermediate ended their season this Saturday, October 15. Varsity volleyball player, Taylor Kodani, reads the sportsmanship announcement following the game. Taylor is a representative for IPA to the ILH Student Advisory Council. Both the Varsity and Intermediate Girls volleyball teams had incredible seasons! Varsity Girls finished their season with a win on October 6 over Lanakila Baptist, taking them in four sets to capture 3rd place overall in the ILH. They were able to string together a number of winning matches over the past few weeks, including victories over Hawai’i Mission Academy Lanakila Baptist, Assets School, and St. Andrews. The team celebrated Senior Night on October 4 at their match against Christian Academy, with the support of a large IPA contingent who turned out to cheer them on. The Varsity Girls end the season with a 7-3 win-loss record. Awesome job, Lady Navigators! The Intermediate Girls volleyball team was on fire this season, besting all their opponents along the way. They went in to the single elimination playoffs with an undefeated record. In the first round of the Championships on October 1, the Lady Navigators beat University Lab School in straight sets, 25-14 and 25-9. They continued their winning streak in the second round on October 4, defeating Christian Academy in straight sets 25-20 and 25-17. The team faced Damien in the D3 Intermediate Championship game at St. Andrews. They played hard and came together with the same determination they showed throughout the season, but unfortunately, came up short with their first loss of the season. It was a difficult loss, but they all put in a heartfelt effort. The Intermediate Girls finished a great season with an 8-1 win-loss record, and 2nd place in the ILH. Congratulations, Lady Navigators!